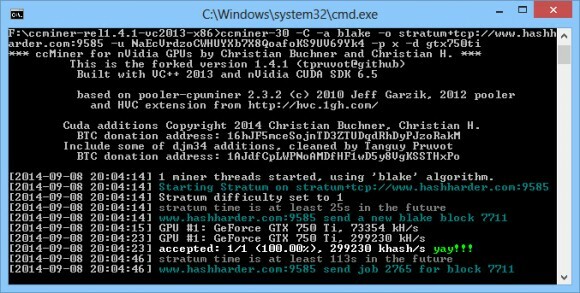 There is a new ccMiner fork for Nvidia GPUs that brings support for the Blakecoin (Blake-256) as well as other new algorithms and crypto coins supported in ccMiner. The new fork by user tpruvot on Github (source) supports not only the standard crypto currencies available in the official ccMiner but also BlakeCoin (256 8-rounds), NEOS blake (256 14-rounds), X14, X15, X17, WHIRL etc. The miner also adds some color options to make the output easily readable, instead of outputting everything as white text on black background. The precompiled Windows binary seems to work pretty well, though we’ve had some trouble using it on a system with two GPUs, but specifying a device option for each and running separately on GTX 780 Ti and GTX 750 Ti had no problems. Do note that the source of this ccMiner fork is made to be compiled with CUDA 6.5 and Visual Studio 2013, though it can also be compiled on Linux, the binary releases available for Windows will also require you to have the most recent version of the Nvidia GPU driver in order to use them. You will need to download and install the latest GeForce 340.72 driver that brings support for CUDA 6.5 (if you are using older driver version), otherwise the miner may not function. The official binary release of the miner does come precompiled for Compute 3.0 and Compute 5.0, so it will not work on older video cards. Are there any speed increases for the previous algos (x11, x13, x15, nist5)? Using the Compute 5 version of this along with the 340.76 drivers brought my 750 TIs from 27xxkhash to 29xxkash each on x11, these results happened on 4 different miners. Nick, how did you get to install the 340.76? It says cannot detect compatible hardware when i run it, have 340.52 installed. Do I have to uninstall the previous version? And there’s already 340.82 out. Will this work with Compute 2.1 Cards? Like the GTX570. Stratobitz, no, unfortunately it will not work on older Compute 2.1 cards.